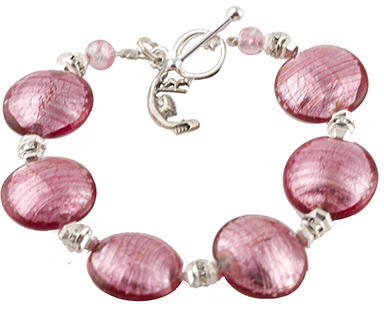 Pink and Pretty our Rubino/Silver foil lentil (a disc shape slightly puffy in the middle) is authentic Murano Glass Jewelry. The approximately 18mm encased .925 sterling silver foil lampwork Murano Glass beads are spaced with silver plated beads and crystal rondells. The clasp is silver plated and features our signature Venetian gondola charm.